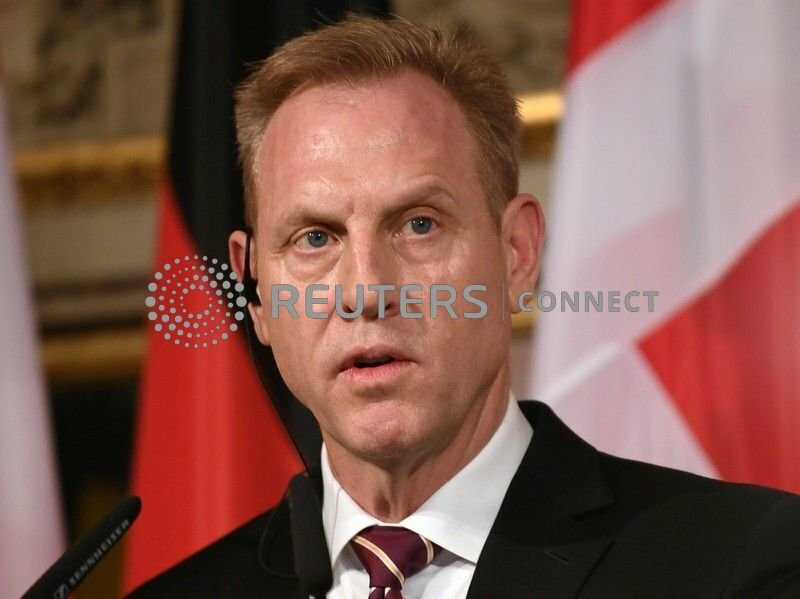 MUNICH, Germany (Reuters) - Acting U.S. Defence Secretary Patrick Shanahan said on Friday the United States was committed to defeating Islamic State in the Middle East and beyond, but officials said European allies were sceptical of Washington's pledges. U.S. President Donald Trump's announcement in December that he was withdrawing all 2,000 U.S. troops from Syria surprised and rattled allies. U.S. officials have crisscrossed the Middle East in recent weeks to reassure them that Washington remains committed to the region. Trump's Syria decision was opposed by top aides, including then-Defence Secretary Jim Mattis, who quit, leaving his deputy Shanahan in charge of the Pentagon. "While the time for U.S. troops on the ground in northeast Syria winds down, the United States remains committed to our coalition's cause, the permanent defeat of ISIS, both in the Middle East and beyond," Shanahan said after a meeting on the sidelines of the Munich Security Conference. The meeting included about a dozen defence ministers from the coalition to defeat Islamic State. Kurdish-led fighters are battling to capture the militants' last major stronghold in Syria, but even without territory, the group is widely seen as a continuing threat. Shanahan said he envisioned a "bigger and stronger" coalition to fight Islamic State globally. "We will continue to support our local partners' ability to stand up to the remnants of ISIS," he added, using an acronym for Islamic State. However, European officials said they were given few details during the closed-door meeting in Munich and many questions remain. "We are still trying to understand how the Americans plan to withdraw," said one European official, speaking on condition of anonymity. Another official said Shanahan did not provide allies with a timeline of the U.S. withdrawal from Syria and allies expressed scepticism during the meeting. A senior U.S. defence official said no commitments were made during the meeting and there was little discussion about timelines. "These meetings don't tend to have specific deliverables or decisions," the U.S. official said. Trump on Friday, though, indicated that he would have solid progress to share very soon. "We have a lot of great announcements having to do with Syria and our success with the eradication of the caliphate and that will be announced over the next 24 hours," he said during a Rose Garden event at the White House. Turkey wants to set up a safe zone with logistical support from allies and says it should be cleared of the U.S.-backed Kurdish YPG militia, which Ankara considers a terrorist group. The U.S. official said the ministers talked about the need for some sort of security arrangement in northeast Syria after the United States has left. Republican Senator Lindsey Graham, speaking at the Munich Security Conference, said the top U.S. general would ask allies to contribute forces to help stabilise areas liberated from Islamic State. France expressed scepticism at the suggestion. "Once the Americans leave we’ll be forced to leave. We aren't going to be the patsy for the Americans," a senior French diplomat said, adding he did not see others ready to fill the void. French Foreign Minister Jean-Yves Le Drian told lawmakers on Wednesday he had doubts about a safe zone. "Who will watch it? Who will be its guarantors? What would be its perimeters?" what allies? you mean those under the economic thumb? What a joke. If Vietnam proved anything as did Afghanistan unless you are willing to totally decimate an entire population of people you can never defeat a guerrilla band of fighters. You can kill a few but the locals will continue to re-supply. This is different than World War II where you had standing armies of the established government. To kill ISIL you either have to lay waste to the entire population of those countries or fight a commando war where your special forces go in and eradicate ISIL pockets. The former is something that the USA would never do. The latter is not a victory but rather like chemo-therapy. It merely keeps the disease in check. Nothing any official says can be seen as reliable so long as trump is president. He has completely undermined trust in American promises. Doesn't matter what he says. The "Commander in Chief" will override whatever solid advice HIS Generals and U.S. Defence Secretary Patrick Shanahan have to say. HE knows more ! Most of them are Acting, Acting, Acting... Just like Trump is acting as a president as opposed to actually being one. So are American generals like General Raymond Thomas, who heads US Special Operations Command, recently contradicted President Donald Trump’s claim that the group ISIS had been defeated. If the American armed forces command shows skepticism towards the US retreating withdrawing from Syria, why would US European allies think any differently? Perhaps if the allies were willing to pay for there own armies this would not be an issue. For example Nato members increase defence spending by $100 billion after Donald Trump called them 'delinquents. Love him or hate him he had a point. Apples and Oranges. Vietnam and Afganistan are countries that no longer wanted foreign masters. You are correct the French and the Americans would have had to lay waste to 100% of the population to win in Vietnam and the Russians/ Americans the same in Afganistan were everything is tribal. ISIS has no country and is nothing more than a group of well-armed thugs strong-arming citizens who are unarmed and basically just want to be left to scratch out a living in a harsh environment. They really don't care if it is Saddam Hussain in charge or pretty much anyone else. That said there is very little local support for ISIS. What Iraq needs is another strong man dictator like Saddam, or divide Iraq into three with the Kurds, Sunnis, Shiites having their own areas. ISIS will be crushed in Syria and whoever escapes will be dispersed across the region. When governments in the region strengthen any ISIS groups form they will be put down Saddam style and maybe the west will turn a blind eye. Maybe the only way for Europe to pay more for their own defense is for US to quit the hundreds of bases they forced on Europe - and GO HOME. As the EU has proven time and time again, they'll only participate if someone else is footing the bill. Without France and the UK, the EU is just an empty shell. All talk, no game. Well, if you want to play that game, we can go all the way back to the Soviet Union's invasion of Afghanistan, which created the massive refugee camps that spawned Islamist jihadi violence. and Co includes Assad. One of many articles below. Also don't forget Assad previously assisted Islamists to enter Iraq to fight the US. Well if you want to play that game , why stop at that and not go back 400 years? ISIS was born due to unrest’s in Syria , unrest’s which were supported or possibly instigated by US.